In the 1890s, Bohemian composer Antonín Dvorák urged American composers to develop their own national music. 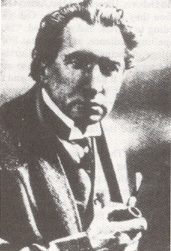 Arthur Farwell led a group of young composers to take up this challenge by leaving behind traditional European music and incorporating the sounds of Native American and African American music into their own compositions. 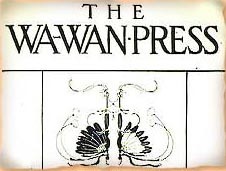 In order to promote this new music, Farwell created the Wa-Wan Press, named for an Omaha tribal ceremony, in December 1901. The Press published vocal and instrumental compositions along with program notes. Farwell outlined his movement's mission in 1903 in "A Letter to American Composers." * All above songs from The American Indianists, Prod. Frederick Schumaker, Perf. Dario Muller, 2 vols, HNH International Ltd., 1994. 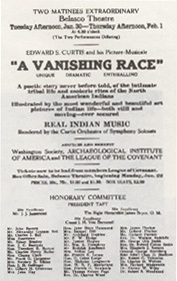 In the winter of 1911-1912, Edward Curtis toured the country with his "musicale," or "picture-opera," A Vanishing Race. 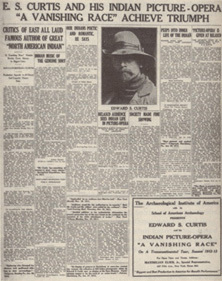 The musicale combined Curtis's lectures, such as "The Intimate Story of Indian Tribal Life" and "The Indians of the Southwest," with photographs, motion pictures, and Gilbert's music. Despite some positive reviews, and Curtis's own enthusiassm about the musicale, it was not the financial success that he had hoped. Curtis toured once more in the 1912-1913 season, but when this tour failed financially as well he took the show off the road. Below are links to a recreation of one of the slide shows using Curtis's photos and Gilbert's composition, "The Kutenai of the Lakes," as well as scripts and program notes from the lectures "The Intimate Story of Indian Tribal Life" and "The Indians of the Southwest." "The Kutenai of the Lakes"
Click on the links to view advertisements for and reviews of A Vanishing Race. Note that the Review from Musical America was written by Arthur Farwell, the head of the Indianist Music movement.